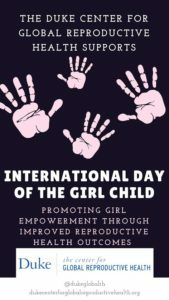 October 11th, 2018 marked the sixth annual International Day of the Girl Child, a celebration which works to establish investment in girls as essential to a sustainable and thriving community. This holiday occurred at a crucial intersection within both a domestic and global narrative. From the election of Brett Kavanaugh to the growing momentum of #MeToo and #WhyIDidn’tReport, sexual violence and other gender disparities have been thrust into the center of public dialogue, igniting the fires of social change. However, to dismantle the culture and practices which systematically devalue women in their present, we must first protect the girl child, as her condition, positive or negative, will ultimately inform her future. This year’s theme of the international day was “With Her: A Skilled GirlForce,” which drew attention to the 25% of unemployed youth, disproportionately consisting of girls. This disadvantaged demographic of girls in the workforce is especially vulnerable to both monetary and sexual exploitation. The very derivation of gender equality is the protection of the girl child, and the onus is upon all of us to do so.